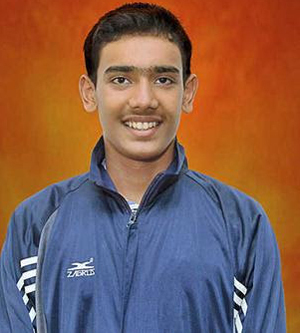 Mangaluru, Aug 25, 2015 : Manohar M. Prabhu, a city lad, has qualified for the forthcoming 8th AASF Asian Age Group Swimming Competitions 2015. He represented Karnataka in the recently conducted National Aquatic Championship organised by the Swimming Federation of India at Pune and won gold medals in 100 m breast stroke, and 4x100 m medley relay, and silver in 50 m breast stroke. The Asian competition is scheduled from October 1 to October 7 at Bangkok. Now he is at a coaching camp for the selected players of the Indian team, at Pune. The swimmer is a member of the Mangalore Aquatic Club and received coaching by Partha Varanasi and Niroop Kotian at the Mangaluru City Corporation Swimming Pool. A Class 9 student of St. Aloysius High School, Kodialbail, he is the son of Manjunath M. Prabhu and Archana M. Prabhu. We are proud of Manohar Prabhu. Keep it up.